The government "does not have a viable plan" to deal with the political stalemate in Northern Ireland, Sinn Féin's president has said. 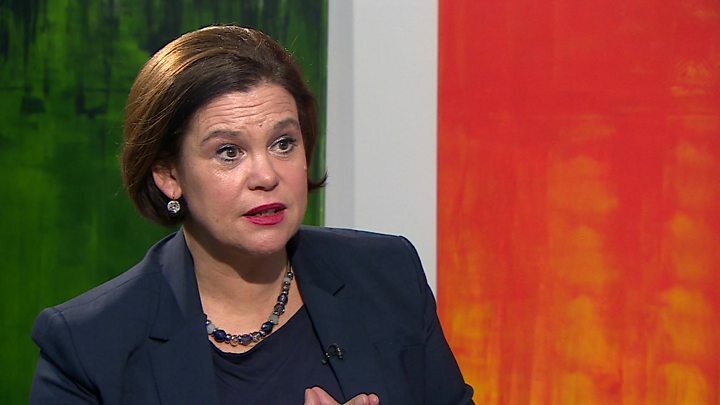 Mary Lou McDonald said she feared "entrenchment and drift" in efforts to restore the executive, which collapsed 13 months ago. PM Theresa May has held talks with Sinn Féin and the DUP at Westminster. It comes exactly a week after talks aimed at ending the deadlock at Stormont collapsed. In an interview with the BBC's political editor Laura Kuenssberg, Ms McDonald accused Mrs May of "facilitating the DUP blocking" the restoration of power-sharing. "I believe whether intentionally or not, Theresa May is actually facilitating the DUP blocking advancement and resolution on these core issues," she said. Mrs May has emphasised that her government remains committed to doing all it can to restore devolution. At a press conference outside Westminster earlier, the Sinn Féin president said: "We can only surmise from our meeting with the British prime minister that the government doesn't have a viable plan for carving a pathway for the restoration of the institutions. "We're disappointed that the government seems wedded to what they are calling 'a reflection period',"
Ms McDonald added that her party called for the "reconvening of the inter-governmental conference as per the Good Friday Agreement" - the 1998 deal which brought an end to the Troubles in Northern Ireland. "We tried to impress upon the prime minister and secretary of state that standing still and doing nothing is simply not an option," she said. "Just because the DUP have crashed the bus, does not mean that everyone has to sit at home now and cross their fingers and hope against hope that things will improve and that these issues will be resolved." Following the DUP's meeting, Arlene Foster said she was hopeful a new budget would be in place for Northern Ireland "within weeks". "The people of Northern Ireland deserve to have a budget in place as soon as possible," she said. Her party colleague, MP Nigel Dodds added that the party "want to see devolved government" reinstated. "In the absence of the devolution that we all want, we can't continue to have Northern Ireland left in limbo as it has been in the last 13 months," he said. "We simply want a commonsense interim position, whereby ministers are taking decisions, budgets are being set, whilst we continue to work through the issues." In relation to the draft agreement which was leaked on Tuesday, Arlene Foster said it contained "only one of a number of documents that were circulated and put out and about". She added that her party was not contemplating introducing an Irish language act in Northern Ireland. During the meetings with Sinn Féin and the DUP, the prime minister said it was important for everyone "to reflect on the circumstances which have led to this". In a statement, a spokesperson for Downing Street said the prime minister will be "working closely with Northern Ireland Secretary and will continue to engage with the parties and the Irish Government." On Tuesday, Northern Ireland Secretary Karen Bradley declined to immediately re-impose direct rule from Westminster. Sinn Féin and the DUP - Northern Ireland's two main parties - had been in negotiations to end a 13-month stalemate at Stormont. The devolved government collapsed in a row over a botched green energy scheme. Talks between the DUP and Sinn Féin collapsed last week, and the two sides blamed each other for an impasse over a proposed Irish language act. The parties still disagree on whether or not a draft agreement was on the table before the talks broke down. On Tuesday, parts of the draft agreement being worked on were leaked and published. These confirmed what had already been reported about a three-stranded approach to the language question - which would have resulted in an Irish language act, an Ulster Scots act, and a so-called respecting language and diversity act. But there was a degree of ambiguity as to whether this had been fully signed off by all the parties. Meanwhile, on Wednesday morning, MPs on the Northern Ireland Affairs committee took evidence on the issue of devolution. They heard from witnesses including SDLP leader Colum Eastwood and loyalist blogger Jamie Bryson. Mr Eastwood told the committee that the power-sharing institutions could be out of action for five years "if we keep doing what we're doing".